This guide was developed by the Health Sciences Library in collaboration with the Division of Clinical Laboratory Science. Information for currently registered off-campus Distance Learners, including students out of town on rotations and fieldwork assignments. Are you an Allied Health Distance Education student having problems using your computer for your classes or to get to library resources? Your best bet is to choose the Chat Support option on the OIS Help Site. Notice the service is only available 8-5 weekdays. The ITRC provides technology support 24 hours a day, seven days a week, for students and faculty. You can also call the Response Center at 962-HELP or email at help@unc.edu. This skills test will check if you have the basic computer system requirements, plug-ins, and skills to take an online course at UNC. 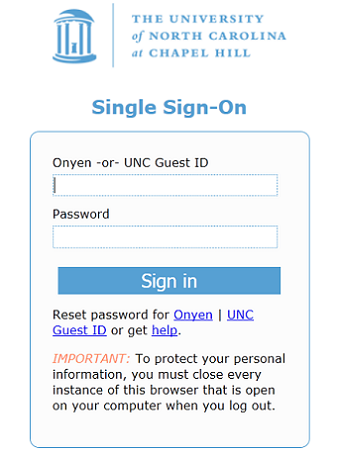 Manage your Onyen, password, and e-mail here. You'll need your birth date and SSN to look up your PID online. A center for information and resources about distance education at the University of North Carolina at Chapel Hill. ITS Software Acquisition provides a single, centralized point of contact to find and obtain software on campus. The ITS Software Acquisition office also provides software media to Students, Faculty, Staff and Visiting Scholars. Procedures for obtaining software will vary depending on the license agreement. Software is free or deeply discounted for qualified UNC users. 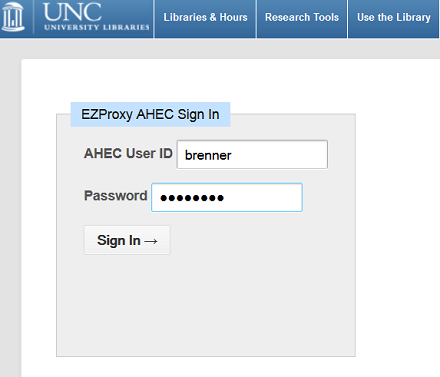 This is what you will see when you are asked to authenticate to use library resources from off campus. First, choose your authentication type. AHEC for AHEC Digital Library (ADL) members including most preceptors and fieldwork supervisors. 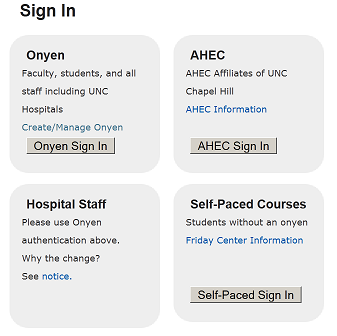 or, for AHEC Digital Library (ADL) users: sign in.